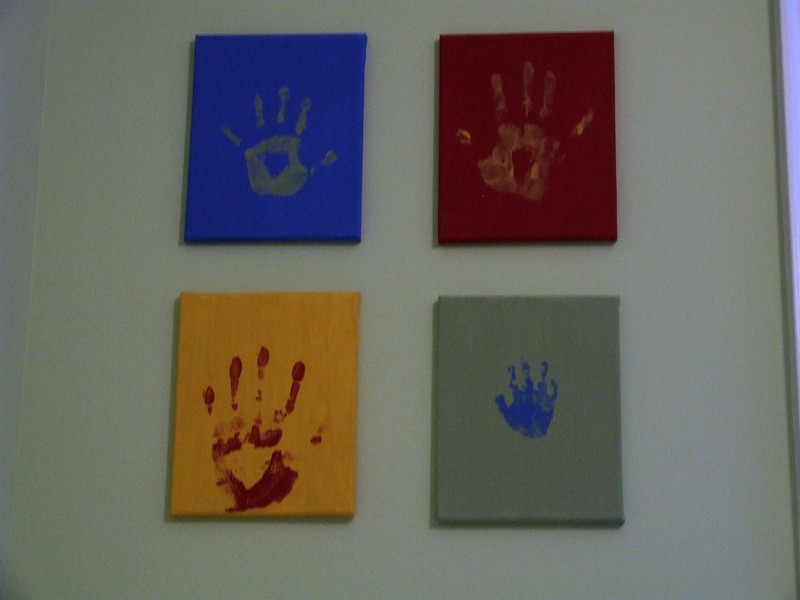 I have been eying this handprint set from Red Envelope for a year. I thought it would be a fun family project for our playroom. Of course I thought I could save money if I made it myself. I bought the products when the canvases and paints were half off at Michaels. I spent approximately $11 on materials. I selected paint colors slightly different than my inspiration to match our playroom. 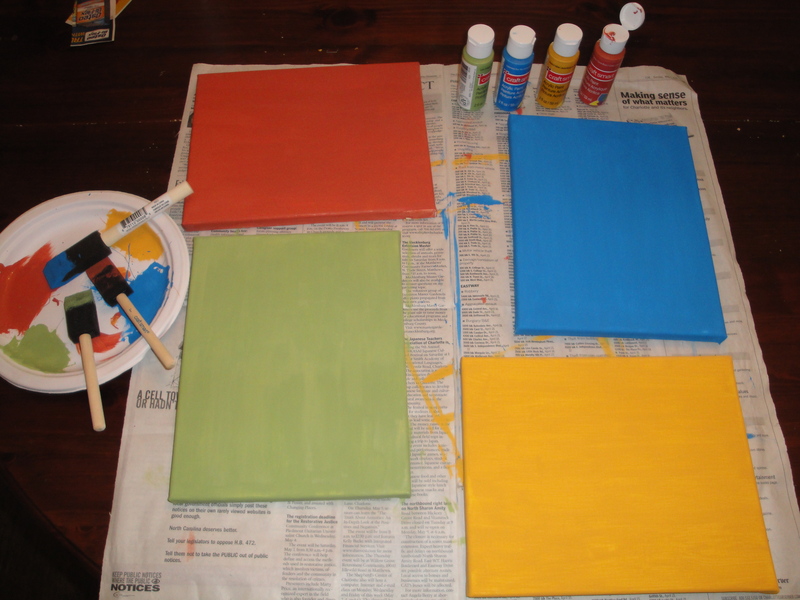 Jacob, my 9 year old, helped me paint the canvases. 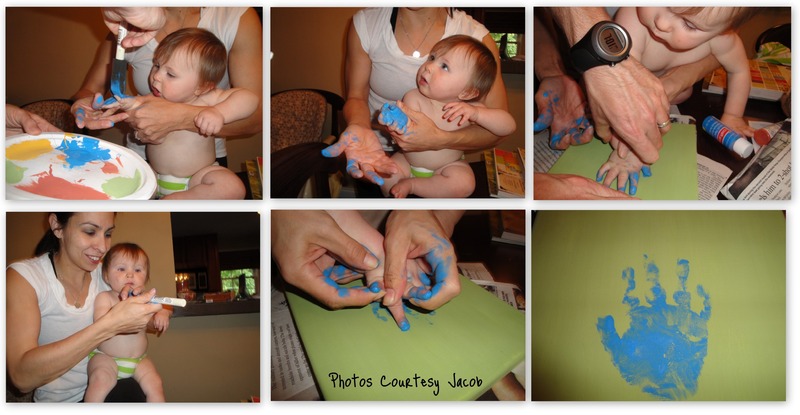 Jacob’s was first up and his handprint was a breeze. Then he helped me with mine. You would think that the most challenging part of this project was getting Lily’s handprint. Little did I know that the 10 month old was not going to be the hold up. Yep, that’s right…It was getting my husband to paint his hand that took forever. It wasn’t that he was unwilling – afterall he helped me with Lily’s handprint. It’s just that the opportunity never presented itself after Lily’s masterpiece. It took almost two months to finish this project. Below are the final results. Yes, Walt’s hand is off center but remember it took two months to get the handprint – I wasn’t going to ask him to fix it! In that two month time frame I repainted the red canvas a deeper red to better match the colors of the playroom. For $11 I love the way this turned out! More to come on the playroom progress next month. This entry was posted in Decorating, DIY Projects and tagged decorating, DIY projects, family. Bookmark the permalink. Looks good! What did you decide for the duet from IKEA? How about a Roman shade? Britt, I used pieces of the duvet. I’ll have to post pictures of that soon. But I wasn’t sure what else to do. I was thinking floor pillows but a roman shade is a great idea! I’ve been dying to replace the temporary paper shade we have there now. Thank you! oh, wow! what a great idea!!! i love it!!!! ps. angie, your arms look GREAT!!!!! Thanks Mel! You are too kind! The arm definition is due to the Insanity workouts. Now I just need to figure out how to maintain it. I’ve seen those too and have always liked them. Yours turned out great! Oh, what a sweet project! And I love DIY. 🙂 Thanks for sharing!